During the 2010-11 Antarctic field season the UNAVCO polar group supported an unprecedented 33 individual PI-based science campaign projects. One hundred twenty receivers and 28,000 pounds of supporting gear was sent to the continent for campaign support, including thirty five new NetR9 systems and twelve netR8's. Nineteen of the NetR9 receivers remain on the ice to support long term data collection at the Whillans Ice stream (WISSARD) and the Byrd Glacier. The WISSARD project also deployed a third continuous site with Iridium comms this season, bringing the total telemetered stations to three for that project. A continuously operating GPS station with Iridium comms was installed on the Ross Ice Shelf for the ANDRILL project in an area known as Coulman High. This site is transmitting valuable information about the behavior of the ice shelf near the grounding line. The WAIS Divide site was rebuilt this season after failing late last year. 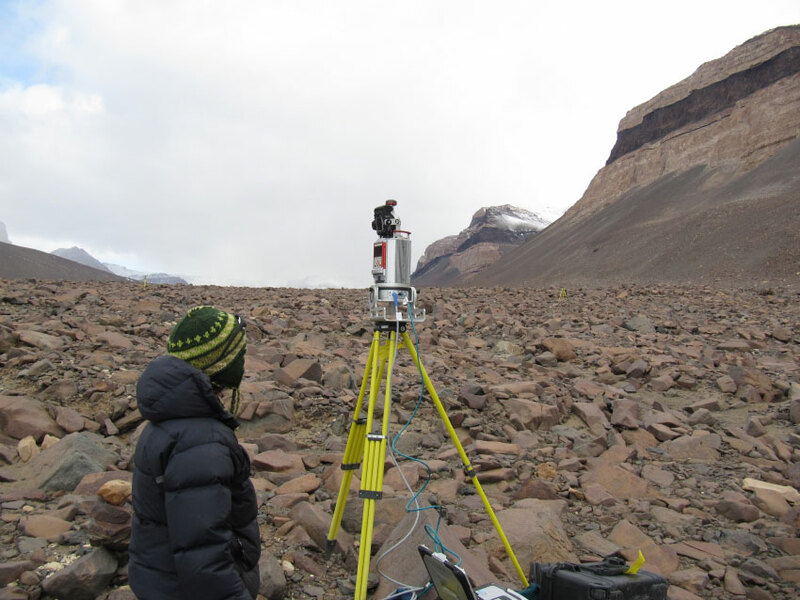 GPS instruments were provided for the ongoing deformation studies on Mt. Erebus (G-081) and in support of the Dry Valleys Long Term Ecological Research projects (Doran B-426, McKnight B-421, Fountain B-425). Six teams were supported in the central Transantarctic Mountains near the Beardmore glacier as part of a multidiscipline effort in the region. This season saw expanding interest in UNAVCO's growing suite of terrestrial LiDAR scanners and nine separate Antarctic projects were given TLS support. The instruments continue to work well in the frigid Antarctic environment. 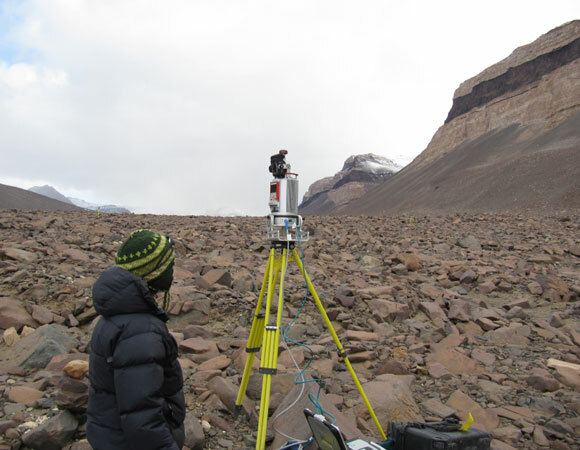 Data was collected in locations ranging from the McMurdo Dry Valleys to the top of Mount Erebus. One TLS instrument traveled aboard the icebreaker ODEN as it made its way to McMurdo Sound and was used to scan sea ice surface features in the Bellinghausen, Amundsen and Ross Seas. Figure 1. High on Mt Erebus, the continuously operating GPS site, MACZ is rebuilt with a more robust frame and other components. Figure 2. Terrestrial Laser Scanner (TLS) imaging polygon features in the lower Beacon Valley. The continuously operating sites provided by TAMDEF and the Polar MRI projects continued to perform well. Several sites were visited for minor maintenance and most had sustained well through the difficult winter months with minimal outages. MACZ, high on Mt Erebus was rebuilt this year in response to severe corrosion and improved designs. The acidic atmosphere and extreme weather had taken a toll on the site. The site received a new 2 panel frame, two new solar panels, two ruggedized Forgen wind generators and a new Hardigg Case. Maintenance was performed at the CONZ installation, which also wintered well this past season. The opportunity was also taken to retrieve data from the continuous site ABBZ. 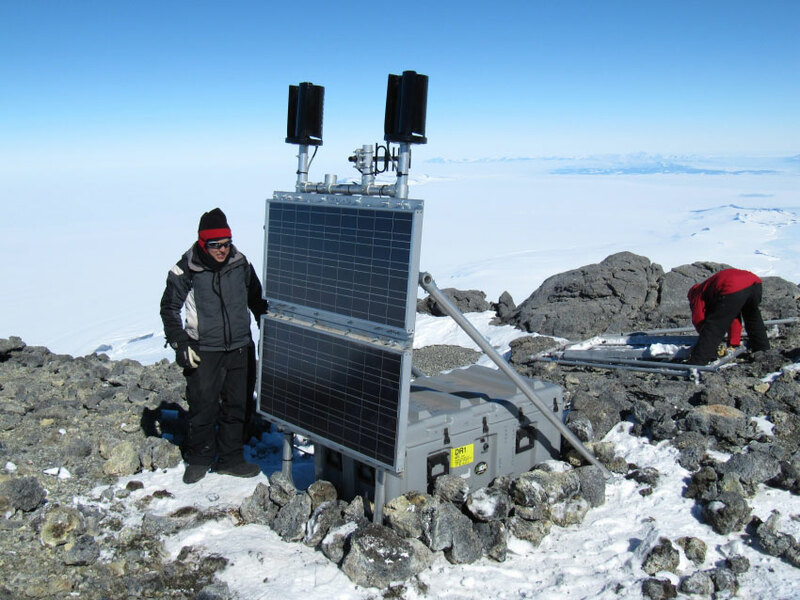 A continuously operating GPS receiver was installed at Mt Erebus site BOMZ to augment the existing network of cGPS units operating on the mountain. A seasonal NetRS Base station was provided for part of the season at Lake Hoare to service regional surveys in the Taylor Valley. Lake levels in the Taylor Valley continue to rise, prompting planning for a new benchmark installation at Lake Fryxell. Benchmarks at all three lakes have suffered from advancing water lines. Data retrieval from Cape Roberts, Mt. Fleming, CONZ and MACZ continuous stations continues through the Truncated Cones repeater site on Mt. Erebus. Data are downloaded daily and delivered directly to the UNAVCO data archive. The telemetered data is collected by receivers at the NASA building 71 in McMurdo. The RTK system servicing McMurdo Station failed over the winter with one of the short haul modems destroyed and a yet unresolved issue lingering in the communications line between MCMD and the repeater shack some distance away. UNAVCO will look at upgrading this system early in the upcoming season.